Mandeville was a small portion of Rancho San Vicente y Santa Monica, a Spanish land grant granted by Juan Alvarado, Governor of the Californians, to Don Francisco Sepulveda, a retired soldier, in 1839. An 1881 map shows our canyon as Casa Viejo Canon and running down the middle was Casa Viejo Creek, which, records show, carried water year-round, and fed by springs in the upper canyon. What is now the 1700 block in Mandeville was shown as Boca de Canon, which means mouth of the canyon. Baker and Jones formed the Santa Monica Land & Water Company, and in 1904 sold it to Robert C. Gillis. In 1917 Gillis formed a subsidiary company, the Santa Monica Mountain Park Company, to handle development of the mountain portion of the acreage. Alphonzo Bell who formed the Los Angeles Mountain Park Company later purchased this, but the only park he ultimately retained and developed was Bel-Air. Just where the Mandeville name came from no one seems to know. Its first appearance on a map was in the early 1900’s and it appears as “Mandiville Canon”. In 1920 the American Appraisal Company appraised the value of the 260 acres from about Mandeville Lane to Chalon Road at $65,000. Things began to boom in Brentwood in the early ’20s and the L.A. Athletic Club decided to build a country club community with surrounding homes. The club now known as the Riviera Country Club was built, and homes were erected. The 1929 economic disaster took the bloom off the rose of the development and the latter was parceled off as individual home-sites. The area within and adjacent to the 1600 block of Mandeville Canyon Road was included. In addition to the country club, the L.A.A.C. also built and operated a championship polo field on the site and to the west of what is now Paul Revere Jr. High School. Top players and peak crowds were regular Sunday events until the press of urban development resulted in this area being subdivided for the school and home-sites. It also became the site for polo competition during the Olympics. In 1926, the Santa Monica Mountain Park Co. sold to Garden Foundation, Inc. most of Lower Mandeville, from roughly Mandeville Lane to Chalon Road, for the purpose of establishing a botanical garden. On the slopes surrounding this plush garden, presumably, lovely home-sites would be developed to attract residential buyers. Plantings from all over the world were installed, many of which are still in evidence. Movie stars dedicated many of the special plantings and some of the commemorative plaques can still be seen. Two ponds were built, one of which now surrounds the Japanese style house at 1888 Mandeville Canyon Road, the other next door at 1900 Mandeville Canyon. Headquarters and sales office for Botanic Garden Park were at 1727 Mandeville Canyon Road. Development of the botanical garden slowed down with depression years and by 1935 couldn’t carry on. Bondholders of Garden Foundation, who held the original pre-depression mortgage of $4 million for the entire 3500 acres in Mandeville Canyon, reorganized as the Garden Land Company and became its stockholders. The canyon floor was immediately subdivided as far as Chalon Road and the first homes were soon started. Devastating rains and flooding occurred in 1938, which literally ravaged Lower Mandeville. So great was economic impact of this disaster that the original Garden Land Company remained practically in limbo for the next 16 years and it wasn’t until 1954 that Garden Land actively resumed property development and construction. This was in Upper Mandeville and following that, the Westridge area of Mandeville where in 1963 Garden Land relinquished their holdings to Link Builders, Inc. and Seacrest Co. 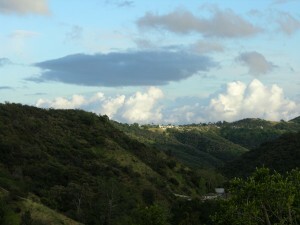 The Upper Mandeville Canyon Association was incorporated in 1957. The aim of the membership then, and now, is to protect and enhance homeowner’s investment in this beautiful area. There were great stretches of undeveloped property along the roadside. Streams and waterfalls flowed yearlong. Lupin and wild morning glory covered the hills and the flatlands. Deer, mountain lions, bobcats, coyotes, skunks, rabbits and rattlesnakes still owned most of the territory. The road was only paved as far as the 3400 block. In the 1970’s, residents in Mandeville Canyon faced the threat of a highly controversial housing development called the Tucker Development located on the ridges above Mandeville. The 1,500 acres of the Tucker property, later known as Eastport/Tucker, extend in the shape of a horseshoe from about the 3500 block on the eastern side of Mandeville to about the 2700 block on the western side of Mandeville. In an exemplary instance of collaboration, Upper and Lower Mandeville joined forces to pay the legal fees incurred in opposing this project. Despite considerable opposition from residents, the City approved the Tucker project. However, economic conditions of the ‘80s turned out to be unfavorable to this project and the landowners subsequently filed for bankruptcy. As part of the settlement, the bankruptcy court allowed the Santa Monica Mountains Conservancy to acquire the Eastport/Tucker property. The Conservancy has since purchased the property, which resulted in a modest regional homeowner’s assessment; a victory for all. In the fall of 1957, the first annual picnic was held, in the area that is now Garden Land Road. This picnic has continued and grown through the years and provides a delightful day for all the family. In the early sixties, the Association sponsored its first annual cocktail party for the Upper Canyon. Residents generously donated their homes and Canyon chefs provided delicious food. Local merchants donated wonderful prizes for the party auction. New residents were especially welcomed at these events. Today the Association continues to serve its original goal. We provide members with an annual telephone directory, a monthly newsletter and dedicated board members monitor safety, community assistance, flood and crime control. We invite all members to be active in the UMCA. Click here to read about L.A.'s Secret Gardens: The California Botanic Garden of Mandeville Canyon.